Connie Patrick said she agreed to pay $250 for refrigerator drawers when she made the costly mistake of giving her credit card number to Repairs R Us, a Philadelphia-area appliance repair company. 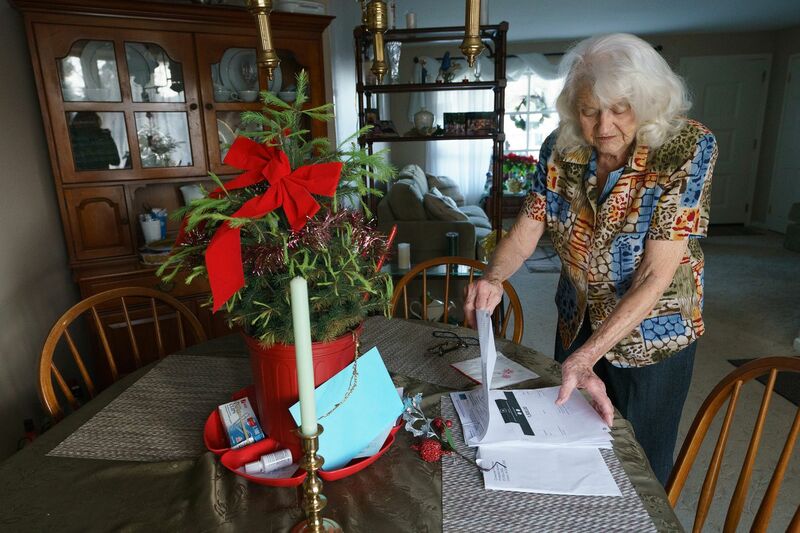 Patrick, an 86-year-old from Feasterville, never received a receipt after the phone call. The drawers didn’t come, either. All she got, weeks later, was the shock of a credit card bill showing that the company had charged her four times, totaling $4,650. You didn’t win a TV. Philly car dealer’s ‘Money Carlo’ ad tricks consumers into thinking they win big prizes. “I’m shaking from all of this,” Patrick said last week. Patrick and her family believe this is an obvious scam. The repair company, initially sent to Patrick’s home by Sears, claims Patrick agreed to pay thousands for a “preventative maintenance plan.” But there’s nothing in writing verifying what she bought. That’s because Repairs R Us concedes it never gave Patrick a receipt or contract. “It was a verbal contract,” said Tammy Martin, owner of Repairs R Us. Legal experts said Patrick was likely entitled to a contract or receipt under Pennsylvania consumer protection laws. But nearly four months after the transaction, Patrick has been unable to get the issue resolved. After Patrick disputed the charges to her credit card, Citibank initially determined two of the charges were valid because “you acknowledge that you participated in the sale by providing the merchant with your account number,” according to letters that Patrick received in December. Citi has since issued a conditional credit for the full amount to Patrick’s account as it investigates the issue. Martin maintains the matter is merely a misunderstanding. In an email, she said Patrick was sold a one-year maintenance plan that covers cleanings, filters, mold build-up, and “anything that is not normal wear and tear” for appliances, plumbing, heating, and cooling. The four charges between Sept. 20 and Oct. 15 -- for $650, $1,500, $1,000, and $1,500 -- were payments toward the maintenance plan and included the drawers, Martin said. She claimed she didn’t fight Patrick’s charge dispute and was told the customer was already refunded, though Citi representatives said the investigation is still ongoing. “I feel bad about the whole thing. I don’t know how to put it in words. I’m not out to take advantage of anyone,” she said. The Better Business Bureau gave Repairs R Us a “D-plus” grade while its sister company, Always Affordable Repairs, got an “F." Consumers complained on the bureau’s website that they were overcharged, never received invoices, or couldn’t obtain refunds. The bureau has stripped Always Affordable Repairs' accreditation because the company failed to answer a customer complaint, a bureau spokesman said. The repair company was good enough to be hired by Sears, the bankrupt retail giant. Sears sent a Repairs R Us technician to Patrick’s home in September to replace her refrigerator’s ice maker, as part of her warranty. Patrick also wanted refrigerator drawers that weren’t covered under the warranty, a Sears spokesman said. That’s when the Repairs R Us technician told Patrick to call his repair company and buy the drawers, Patrick said. Connie Patrick opens the broken drawers on her refrigerator. In a statement, Sears and its partner Cross Country Home Services said they “consistently assess the licensed and insured service providers within our network." They said that Repairs R Us is not part their service network “at this time,” but that this is unrelated to Patrick’s issue. Martin, who said she runs the repair business by herself with some family help, said an employee later called Patrick to sell her the maintenance plan. She said her company would normally email or fax a contract, but couldn’t because Patrick was “not tech savvy." She acknowledged she could have mailed it, but said the plan was to have Patrick sign the contract when the drawers were installed. Lawyers pointed to several Pennsylvania consumer protection laws that require merchants to provide consumers contracts or receipts. Joann Needleman, a consumer finance lawyer, noted that under the Pennsylvania commercial code, sales of goods of more than $500 must be in writing. “In contract law, there is an inherent duty to act in good faith and to provide disclosure about what consumers are contracting for. It sounds like in this particular case, that didn’t happen," said Needleman, of the business law firm Clark Hill, which has an office in Philadelphia. Jeremy Spiegel, a consumer protection lawyer in Philadelphia, said one could argue the repair company violated a part of Pennsylvania’s unfair trade practices law that typically deals with door-to-door sales. He said courts have construed that provision broadly and it requires companies to provide a written receipt and notice of cancellation. The Pennsylvania consumer protection law also includes a general provision prohibiting fraudulent or deceptive conduct that creates a likelihood of confusion or misunderstanding. Martin cast herself as a generous person who spends much of her time and money rescuing the homeless while taking care of her disabled veteran husband and three children. That’s no excuse to defraud an elderly woman, DiGiulio, Patrick’s daughter said. “We’re trying to survive, too,” Patrick said.